Deer Fence sometimes is called Game-Proof Fence or simply Game Fence. Some people even call it High Fence. Basically is all the same fence. The benefit to this type of fencing is that keeps animals or humans either "in" or "out". Whether you are trying to maintain deer (whitetail, axis, fallow, silka or mule deer) elk, antelope, cattle, buffalo or other exotic animals, it is by far your best choice. Usually our high fence is either 12 or 14 tall in height to ensure the highest reliability and protection of your fencing system and protection to your animals. J. 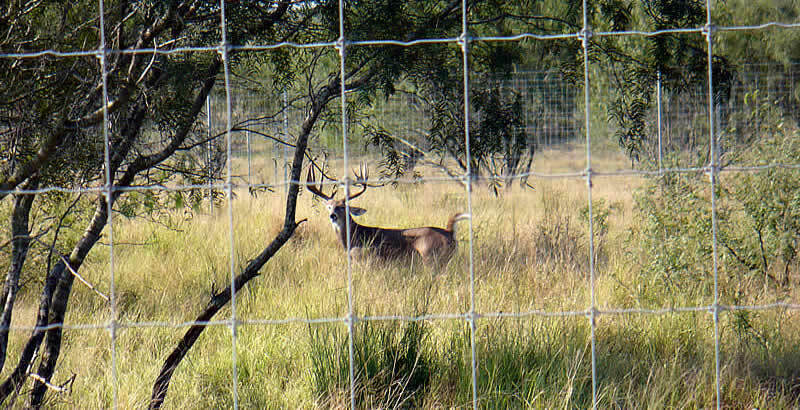 Mark Threadgill & Company offers the highest quality deer fence materials and installation and has been one of the leading High Deer Fence Contractors in Texas for many years. Barbed wire is a type of fencing that uses sharp, pointy barbs to deter animals from crossing. It is most commonly used to secure cattle, sheep, goats, hogs and horses on ranch and farm operations. When it was originally created back in the wild west days, barbed wire was used primarily for restraining cattle. Before barbed wire was invented in the 1860’s, cattle were pretty much free to roam the plains as they pleased, severely limiting farming and ranching operations. Barbed wire fences became very popular in the early 1900's especially in the prairies, where lumber for post was pretty rare. Today, barbed wire fencing is much more commonly seen at the top of security chain link fencing. Generally when someone sees a barbed wire fence, they see an impassable barrier. Aside from security and intrusion , barbed wire fences are still used to keep cattle and other animals off the roads and highways all across the United States. Another place barbed wire is also commonly used today is around construction sites to showcase that it is dangerous to enter the protected area. No matter what your barbed wire fencing needs are, J. Mark Threadgill Fence Company can build from a few hundred feet to hundreds of miles of fence. If you want a relatively maintenance free fence then pipe fencing is the perfect solution for your farm or ranch. It is durable, practical, attractive to contain most any type of livestock or animal, including horses and cattle. Pipe fencing has become quite popular over the years, especially for farm, ranch and rural properties. The biggest benefit is it look great and it provides security and containment while allowing almost complete visibility through it, while adding value to your property. Another benefit to pipe fencing is it comes in a variety of construction options and colors. Your pipe fence can be custom designed with horizontal rails and cross bars however you may like. Pipe fencing can also be customized to your liking with several different types of attached materials such as wire, horse wire, barbed wire, hog panels and netting wire. Color options are unlimited as the pipe fence can be painted to match your entrance or ranch house colors. Pipe fences in general are best for horse/equestrian & cattle fences, with pipe railings that help contain larger animals. Adding cable to your Pipe fencing is another great solution, mostly for horse fencing, as it provides some "give and flexiblity" in case a horse were to get his foot between the cables. 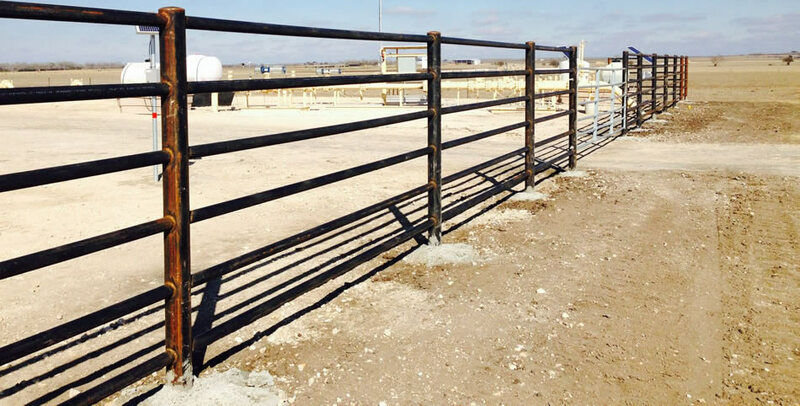 Overall, Pipe fencing can be the ultimate eye appealing fencing solution for your ranch or farm. Cattle Fencing is usually a barbed wire type of fencing that uses sharp, pointy barbs to deter cattle from crossing the path. When it was originally created back in the wild west days, barbed wire was used primarily for restraining cattle. Before barbed wire was invented to control and manage cattle back in the 1860’s, cattle were pretty much free to roam the plains as they pleased. Using barbed wire fences for cattle became very popular by the early 1900's especially in the prairies, where lumber for post was pretty rare. Today, cattle fencing comes in many types and forms including high tensile barbed wire cattle fence such as Gaucho Brand or American Brand or proven standard in cattle fencing, which is easy to maintain and an economical containment system for any size herd. Secondly, netting wire cattle fencing is a great choice for a secure barrier when it is needed to keep small calves in and predators out. Netting wire cattle fence is sometimes called woven wire cattle fencing. J. Mark Threadgill and Company has many years of experience building all types of fences. Contact them today for a free price quote on your next fencing project.